Whether you are organising work celebrations or planning a friends’ get-together, a Classic Christmas Party with us offers a great opportunity to let your hair down and party the night away! 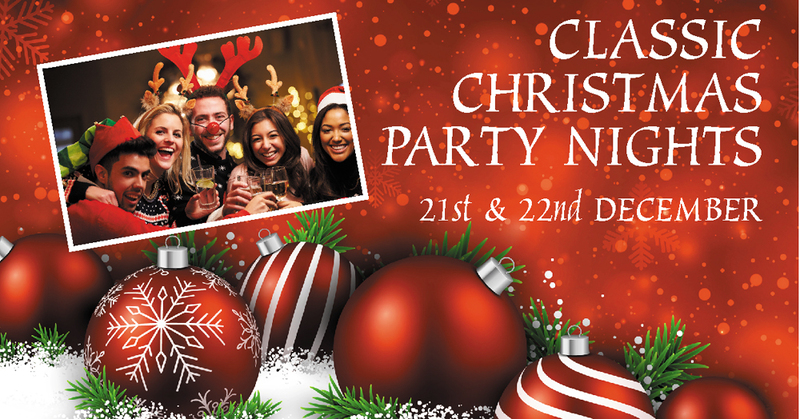 Our Classic Christmas Party Nights will be held on Friday 21st and Saturday 22nd December. Party-goers will be treated to a welcome glass of festive bubbles, a delicious three-course dinner prepared by our AA Rosette-awarded Chef, Brad Roe, and followed by coffee and mince pies. Also included are Christmas crackers and table novelties including entertainment from our DJ. Our Pay Bar will be open throughout the evening, but you can pre-order your drinks for the table before you arrive. The bar opens at 7.00pm, with dinner served at 7.45pm. last orders will be 11.45pm with Carriages at 12.30am. The price per person for this event is £40. We can hold a booking reservation for up to 14 days before you confirm. A £15 per person deposit is required to confirm your party booking but please note that paid deposits cannot be off-set against other party goers should your final numbers drop. Once your booking is confirmed you will be sent a menu selector to detail your party’s requirements. Please call the events team on 01983 855397 to check availability. All prices quoted include VAT. Details of payment methods are listed on the booking form. Please note that if due to unforeseen circumstances the event is cancelled by Ventnor Botanic Garden, then all monies will be repaid to the party booker.